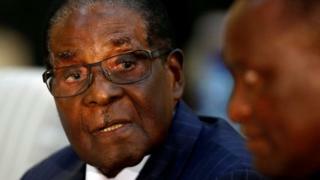 The World Health Organization has revoked the appointment of Zimbabwe's Robert Mugabe as a goodwill ambassador following a widespread outcry. "I have listened carefully to all who have expressed their concerns," WHO head Tedros Adhanom Ghebreyesus said in a statement. But critics pointed out that Zimbabwe's healthcare system had collapsed in recent years. Mr Tedros said he had consulted with the Zimbabwean government and decided that rescinding Mr Mugabe's position was "in the best interests of" the WHO. He said he remained "firmly committed to working with all countries and their leaders" to build universal health care. Mr Tedros, elected in May under the slogan "let's prove the impossible is possible" had said he hoped Mr Mugabe would use his goodwill ambassador role to "influence his peers in the region". The BBC's Andrew Harding in Johannesburg reports that Mr Mugabe's supporters are likely to see this episode as Western meddling in Africa. The about-face will raise questions over the leadership of the WHO's new director general Dr Tedros Adhanom Ghebreyesus. The decision to honour Mr Mugabe is likely to have been taken several weeks ago, and at no point did Mr Tedros seem aware that appointing as goodwill ambassador a man who has been accused of human rights abuses, and of neglecting to the point of collapse his own country's health service, might be controversial.